Each Thrift Store Website comes with several form pages already set up (you can always add more form pages at anytime as well). To get started go to your Form Page and click on the Edit Special button (providing that you have that page set as a Form Page Basic page in Edit Menu area). Start by entering the email address you would like the form sent to, the subject, and the response. 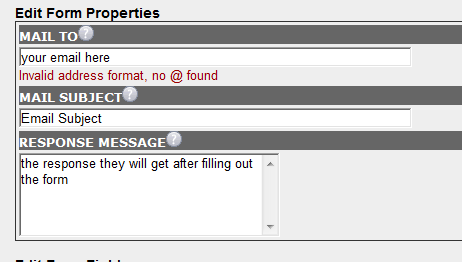 Next, start adding your fields; start by selecting the Save and Add New Field. After you have a few fields added, select the type of field and label them, then click on Save. This image will show you what each type of field will result in. There are no colored sections with the basic form like there are with the advanced form. Click on Save, then close the window.